A field instrument has been developed for the purpose of measuring gas-phase atmospheric iodine species in the marine boundary layer. Vacuum UV resonance-fluorescence (RF), generated using a microwave discharge lamp, is employed to detect atomic iodine via the (5p46s)–(5p5) transitions around 178–184 nm. The system can be operated in two modes; either to directly measure ambient iodine atoms, or to measure the total photolabile iodine loading of ambient air, through broadband visible photolysis of photolabile iodine-containing species, with subsequent RF detection of the iodine atoms released. In both cases the instrument allows for the in situ measurement of the species detected, which is advantageous for gathering information concerning their local sources and distribution. The instrument is calibrated through generation of a known concentration of iodine atoms from the photolysis of I2 using a mercury pen-ray lamp. The instrument was deployed for the first time in August 2007 at Mace Head on the west coast of Ireland; initial results from this field trial are presented. Ambient iodine atoms were measured at levels up to 22 ± 4.8 ppt during the day, coinciding with the lowest tides, when Laminaria seaweed beds were exposed. The total photolabile iodine loading was also measured during several night-time and day-time periods and was found to correlate inversely with tidal height. Inferred I2 concentrations based on these measurements indicate levels of several hundred ppt at the Mace Head site. These measurements represent the first direct observations of ambient iodine atoms and measurement of total photolabile iodine in the atmosphere. 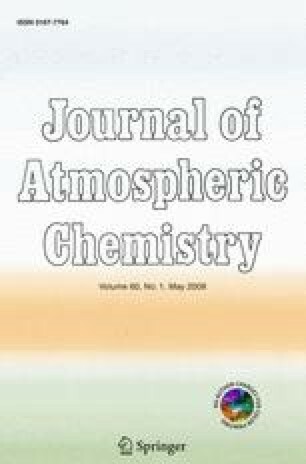 The authors would like to thank the staff at the Mace Head Atmospheric Research Station and NUI Galway, in particular G. Jennings and G. Spain. Meteorological and supporting measurements were provided by G. Spain. Thanks also to colleagues at the University of Leeds; in particular A. Goddard, J. Dixon and P. Halford-Maw for technical assistance and advice. Support for access to Mace Head was given by the European Community—Research Infrastructure Action under EUSAAR TNA programme. The funding for this research was provided by the UK Natural Environment Research Council (grant NE/D005272/1).